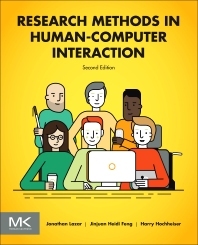 Research Methods in Human-Computer Interaction is a comprehensive guide to performing research and is essential reading for both quantitative and qualitative methods. Since the first edition was published in 2009, the book has been adopted for use at leading universities around the world, including Harvard University, Carnegie-Mellon University, the University of Washington, the University of Toronto, HiOA (Norway), KTH (Sweden), Tel Aviv University (Israel), and many others. Chapters cover a broad range of topics relevant to the collection and analysis of HCI data, going beyond experimental design and surveys, to cover ethnography, diaries, physiological measurements, case studies, crowdsourcing, and other essential elements in the well-informed HCI researcher's toolkit. Continual technological evolution has led to an explosion of new techniques and a need for this updated 2nd edition, to reflect the most recent research in the field and newer trends in research methodology. This Research Methods in HCI revision contains updates throughout, including more detail on statistical tests, coding qualitative data, and data collection via mobile devices and sensors. Other new material covers performing research with children, older adults, and people with cognitive impairments. Jonathan Lazar is a professor in the Department of Computer and Information Sciences at Towson University and has served as director of the Undergraduate Program in Information Systems since 2003. He also founded the Universal Usability Laboratory at Towson University and served as director from 2003 to 2014. In the area of human-computer interaction, Lazar is involved in teaching and research on web accessibility for people with disabilities, user-centered design methods, assistive technology, and law and public policy related to HCI. He has previously authored or edited 10 books, including Ensuring Digital Accessibility Through Process and Policy (coauthored with Dan Goldstein and Anne Taylor), Disability, Human Rights, and Information Technology Accessibility (coedited with Michael Stein), Universal Usability: Designing Computer Interfaces for Diverse User Populations, and Web Usability: A User-Centered Design Approach. He has published over 140 refereed articles in journals, conference proceedings, and edited books, and has been granted two US patents for his work on accessible web-based security features for blind users. He frequently serves as an adviser to government agencies and regularly provides testimony at federal and state levels, and multiple US federal regulations cite his research publications. His research has been funded by the National Science Foundation; National Institute on Disability, Independent Living, and Rehabilitation Research (NIDILRR); American Library Association; and TEDCO. He currently serves on the executive board of the Friends of the Maryland Library for the Blind and Physically Handicapped and the State of Maryland Work Group on Increasing the Teaching of IT Accessibility Concepts in State Universities. He has served in multiple roles in the Association for Computing Machinery Special Interest Group on Computer-Human Interaction (ACM SIGCHI), most recently, adjunct chair of public policy (2010–15) and Digital Accessibility Chair (CHI 2014). Lazar has been honored with the 2017 University System of Maryland Board of Regents Award for Excellence in Research, the 2016 SIGCHI Social Impact Award, given annually to an individual who has promoted the application of human-computer interaction research to pressing societal needs, the 2015 AccessComputing Capacity Building Award (sponsored by the University of Washington and the National Science Foundation) for advocacy on behalf of people with disabilities in computing fields, the 2011 University System of Maryland Board of Regents Award for Excellence in Public Service, and the 2010 Dr. Jacob Bolotin Award from the National Federation of the Blind, for working towards achieving the full integration of the blind into society on a basis of equality. In 2012, Lazar was selected to be the Shutzer Fellow at the Radcliffe Institute for Advanced Study at Harvard University, where he investigates the relationship between human-computer interaction for people with disabilities and US disability rights law. Jinjuan Heidi Feng is a professor in the Department of Computer and Information Sciences at Towson University. She conducts research in the areas of human-computer interaction, universal accessibility, health informatics, and usable and accessible security. She works closely with national and local communities to improve the quality of life for people with disabilities through information technology. Her current research projects focus on assistive technologies for people with cognitive disabilities in educational and professional settings, mobile applications for health related activities, and accessible security techniques for individuals with visual or cognitive disabilities. Her research has been funded by various national and state agencies such as the National Science Foundation (NSF), the National Institute on Disability, Independent Living, and Rehabilitation Research (NIDILRR), and TEDCO. Her work has been published in various top-notch journals and presented at conferences such as Human-Computer Interaction, ACM Transactions on Computer-Human Interaction, and ACM Transactions on Accessible Computing. She has received the Maryland Daily Record's “Innovator of The Year Award” twice, in 2009 and 2016. Dr. Feng was appointed as the director for the School of Emerging Technologies in Fall 2015 and is leading the effort to promote interdisciplinary collaboration across the Towson University campus. She currently serves on the editorial board of ACM Transactions on Accessible Computing. She also served as the general conference chair for the 18th ACM SIGACCESS International Conference on Computers and Accessibility (ASSETS 2016). Harry Hochheiser is currently a faculty member in the Department of Biomedical Informatics and the Intelligent Systems Program at the University of Pittsburgh, where he is actively involved in the Biomedical Informatics Training Program. Previously, Hochheiser served as an assistant professor at Towson University, and worked at Massachusetts General Hospital, Tufts University School of Medicine, AT & T Bell Labs, IBM T.J. Watson Labs, and the National Institutes on Aging. Working at the intersection of human-computer interaction and healthcare informatics, his research has covered a range of topics, including human-computer interaction, information visualization, bioinformatics, clinical informatics, universal usability, security, privacy, and public policy implications of computing systems. His research has been funded by the National Cancer Institute, National Library of Medicine, the Centers for Disease Control and Prevention, and the Baobab Health Trust, among others. Hochheiser has taught and developed several courses at both undergraduate and graduate levels, including introductory computer science, introduction to algorithms, information visualization, advanced web development, and human-computer interaction. He is a member of the US Public Policy Committee of the Association of Computing Machinery, and of the American Medical Informatics Association (AMIA) public policy committee. Hochheiser is co-recipient of the 2009 Maryland Daily Record's “Innovator of the Year Award” with Lazar and Feng, for the development of improved web-based security features for blind users. Excellent background for experiment design and analysis in HCI. Many people do not get this background in their education. It's a very detailed and helpful book.